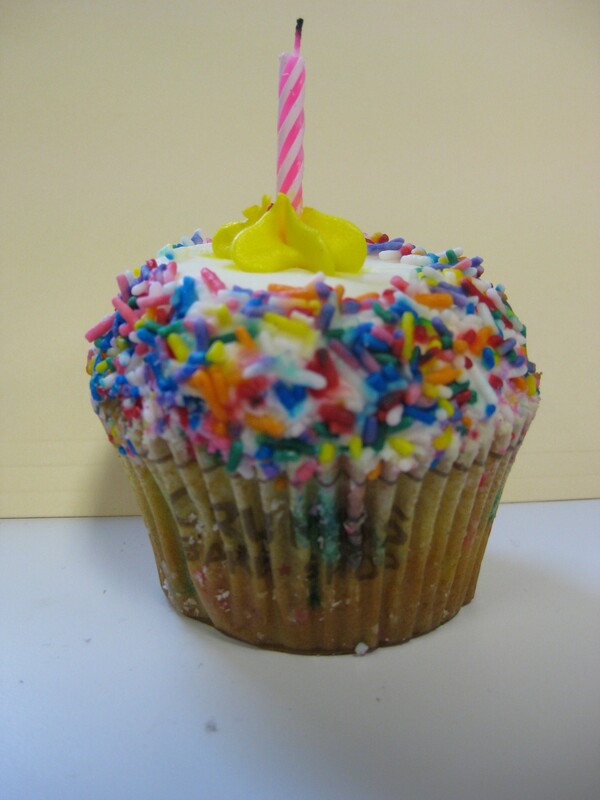 The delicious birthday cupcake from my office... devoured soon after this photo shoot! It’s been 4 weeks since my first post and in celebration of this milestone I am making birthday cake ice cream. Oh, and it’s my birthday too – a double whammy!! I was baffled until someone mentioned that at Coldstone all they do is pour actual cake batter into the ice cream mixture and viola – the ice cream is made! I had to get my hands on this recipe so I scoured the internet for the best possible recipe. It seemed that everyone was in search of the same thing: Coldstone Creamery’s recipe. Not happening. That’s proprietary information. So, I decided to fuse a few different recipes that were available, and make my own concoction. For the past few weeks, all my recipes have used a combination of whole milk, half-and-half, and cream (don’t gasp at that, you should have seen what the original recipes called for!). The other night The Husband asked if I would consider making an ice cream with skim milk. I said that I was up for the challenge and would embrace it when the time was right. Ladies and gentlemen, now is that time! I have to admit, I was petrified. All the reviews I read said that there was no difference between the cake batter ice cream made with cream, whole milk, or skim milk, but I was still skeptical. Thus far, my ice creams have been really creamy, and I am scared to lose that reputation. But, in honor of my birthday, I decided it was appropriate to take a risk. I have nothing to lose (except a potentially icy and disgusting ice cream, but what the hell!). 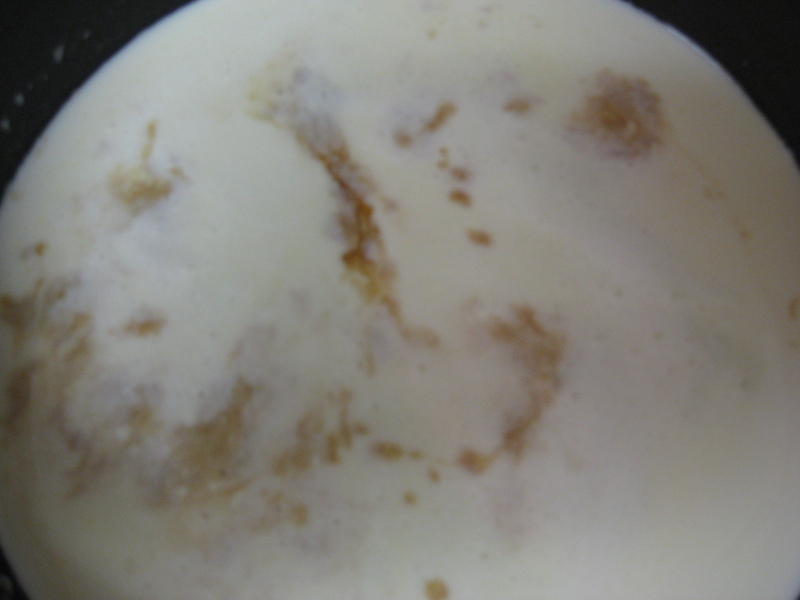 Heat the milk, sugar and vanilla on the stove top until the sugar dissolves. Whisk in the cake batter so it is entirely mixed together and devoid of clumps. Pour the mixture into an airtight container and cool completely in the refrigerator, at least 2 hours or overnight. When the mixture is completely cooled, pour into the bowl of your ice cream maker and churn according to the manufacturer’s instructions. For me, this was 20 minutes. The ice cream was still rather soft once I took it out of the ice cream maker, so be sure to freeze it for approximately 2 hours before serving. 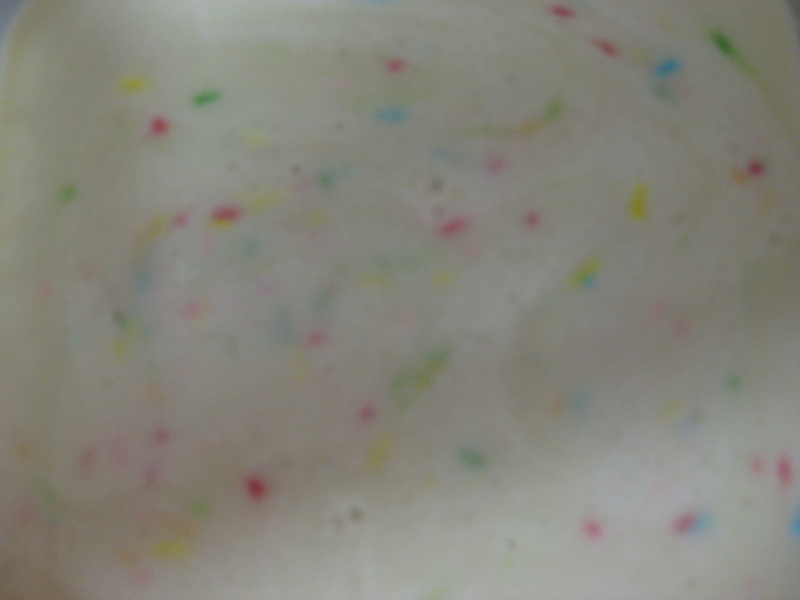 Minor detail # 1: While the Funfetti birthday cake mixture looked really colorful when going into the ice cream maker, I was dismayed to find that all the sprinkles melted into the ice cream, and completely disappeared when churned. I guess this means that it doesn’t matter what kind of cake mix you use, they’ll all end up the same color! Minor detail #2: This is the sweetest damn ice cream I have ever tried! Holy moly! You have to understand that me calling something too sweet is akin to the pot calling the kettle black. I. Love. Sweets. We all know that, but this is in an entirely different league! All the reviews online said that this recipe was too sweet, so most people recommended cutting 1/4 cup of sugar out of the recipe, which I did. Next time I might cut even more (though I know I might run the risk of an overly “icy” ice cream due to the lack of sugar). 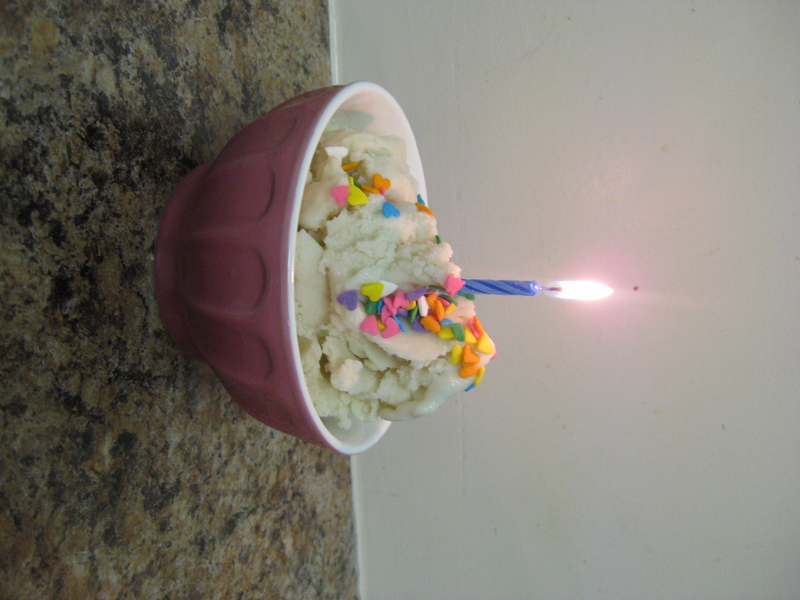 Minor detail #3: I recommend that when serving this treat you “dress it up” with rainbow sprinkles to really underscore the “birthday flavor.” Otherwise it’s just any old off white ice cream. The Verdict: It tastes just like birthday cake. Very sweet birthday cake, but cake nonetheless. Be sure to leave it out for 10-15 minutes before serving (or zap it in the microwave for 15 seconds) because it is slightly icier and firmer since it’s made with skim milk and less sugar. The Husband loved this ice cream and could not believe how creamy it was, despite the fact that it had no cream at all! I myself marveled at this fact, and am now committed to make more “low fat” ice creams! I even brought the quart downstairs to our doormen, and at 11:30pm after a long day they were thrilled to enjoy this frozen treat. One of the gentlemen remarked “Yo, this is way better than all that other stuff .” Behold, the power of an amazing compliment! HAPPY BIRTHDAY! I am subscribing as soon as I leave this message. Looking forward to all the fabulous recipes! Is ice cream kosher? [Heh, I’m assuming it is.] We missed you guys at the BRK Conference! Happy Birthday! Just found your blog, and am excited to know I am not the only wildly lactose intolerant person out there that loves a bowl of tasty frozen confection. Hope all is well and thanks for reading. What?? I had NO IDEA it’s YOUR blog! I saved it to my favorites as soon as I saw it on your gmail chat! I think it’s the best idea in the world, and it’s just so Naomi! Congrats and can’t wait to see your new recipes! Oh and happy belated birthday! Cheers!! Thanks I was wondering what marble slabs “birthday cake” flavour is supposed to taste and now I realize. Duh it’s cake batter flavour. I will be making some tomorrow.